St Paul at Ephesus – Derrng-do or hocus pocus? Harbour street Ephesus, leading to the Great Theatre and centre of town. The marble-paved street In its heyday had been lined with pillared arcades and illuminated at night. 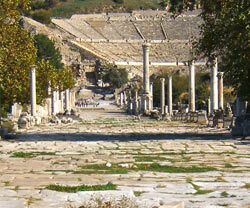 Around 300,000 people lived in Ephesus in the mid-1st century. Did a Jewish evangelist called Paul really turn this sophisticated city upside down? 3rd Mission in about 100 words? "After he had spent some time there [Caesarea], he departed and went over the region of Galatia and Phrygia in order, strengthening all the disciples ... Paul, having passed through the upper regions, came to Ephesus ... In the synagogue he spoke boldly for three months disputing ... then daily in the school of Tyrannus. And continued by the space of two years, so that all they which dwelt in Asia heard the word of the Lord Jesus, both Jews and Greeks ... After the uproar had ceased, Paul called the disciples to himself, embraced them, and departed to go to Macedonia. Now when he had gone over that region and encouraged them with many words, he came to Greece and stayed three months." Evidence of Jews in Ephesus – Graffiti! Wow! The spectacular library of Celsus, Ephesus. No evidence of a synagogue has ever been found in this vibrant pagan metropolis – but scratched into one of the marble steps of the library is a Jewish-style candlestick. With such scant evidence of Judaism, did Paul really "speak boldly for three months" in a synagogue in Ephesus? 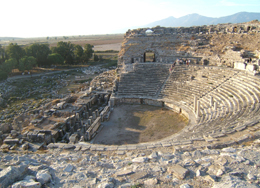 From the theatre at Miletus: On the fifth row of seats are the words, in Greek: "For the Jews and the God-fearers". Evidence in stone that the Jews were assimilating into Roman-Hellenic culture. 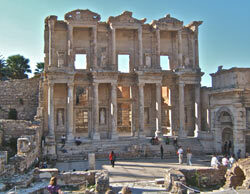 The great attraction of Ephesus for pilgrims was the Artemision, one of the seven wonders of the world. John Chrysostom, Patriarch of Constantinople, commissioned fanatical monks to destroy the sanctuary in the early 5th century. All a fiction – but it set the tone for the centuries that lay ahead. 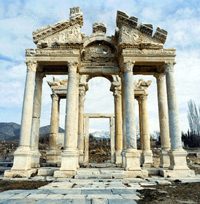 Named for the goddess of love, Aphrodisias had a population of 150,000 as early as the 2nd century BC. In the imperial age the city was one of the leading centers of architecture, art, and sculpture. 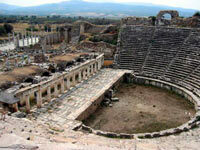 Its theatre was larger even than that of Ephesus. 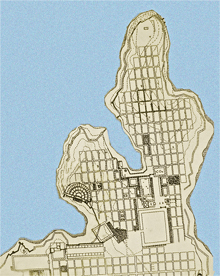 Miletus occupied a peninsula in the "time of Paul". The busy port had harbours on both sides of its peninsula. A Sacred Way more than 100 feet wide led from the city for 12 miles to Didyma, a sanctuary-city famous throughout the known world for its oracle. Each year inhabitants and pilgrims followed the sacred route to the Temple of Apollo. Beyond the tree line is a fertile plain. In antiquity it was the sea. Apollo and Artemis were said to be twins born to Zeus and Leto. Augustus was one of many emperors to visit the sanctuary. Oracular utterances were the "words of the Lord" – in this case, Lord Apollo. The apostle Paul seems not to have noticed this world-famous pilgrimage site. Perhaps he was too busy handing out hankies to "all of Asia". In the 5th century this crudely built "Bishop's Church" displaced the bathhouse. The building ignored the ancient alignment of streets and – as seen here – reduced the Roman road to a narrow alleyway. Welcome to the Dark Age. Laodicea had its own bank and mint. "Laodicea. Although Paul mentions the church there, there is no record that he visited it." Paul's preaching – a threat to trinkets? No kidding! House of Mary Mother of Jesus at Ephesus? Behold, the lack of references to JC's Mother! Mary has a house on a mountaintop near Ephesus (yes, you can visit it!). Apparently, it was built by the apostle John. Paul lived three years in Ephesus and nether he nor his "biographer" Luke mentions either Mary or John. So which part of this is rubbish? Acts of the Apostles, together with Eusebius' History of the Church – the primary documents of early church history – present a fake history, crafted to tell an uplifting story of how "The Way", a marginal sect within Judaism, became "The Church", a universal brotherhood of Christian fellowships spread far and wide. The pivotal figure in this glorious revolution was purportedly the apostle Paul and the climax to the story has the superlative missionary raising the glorious banner of Christ in Rome itself. Yet for all the heroics that fill the pages of the authorized story, the reports of Paul's "evangelisation" of vast areas of the eastern Roman Empire are a triumph of brevity. This is especially true of Paul's third missionary journey. Around a scant one hundred and thirty words are all that we have for the great mission, that and a few curious, quite surreal, tales. The first relates to a group rebaptism. Paul was "forbidden" by the Holy Spirit to enter the Roman province of Asia on his second missionary journey (Acts 16.6) which makes it all the more curious that he faced NO such prohibition on his third journey only a few years later. What on earth could the Holy Ghost have been thinking? In Paul's absence, rivals have been active. It seems that on arrival in Ephesus, Paul finds twelve male disciples – well, it would have to be 12, wouldn't it? – who had received only the "baptism of John". Alarmingly, they had "not so much as heard of" any Holy Ghost. Fancy that. Just whose disciples are they then? Paul tells them that they need to be baptized in the name of the Lord Jesus, the magic incantation. This they do without a word of argument, and when the apostle places his hands upon them he becomes a conduit for an infusion of the the Holy Spirit. Immediately the neophytes begin to "speak in tongues" and prophesy, just like the disciples had on the day of Pentecost. As if. What we have here is the assimilation of a rival sect, a Jewish baptist cult, and clearly one pre-dating Pauline Christianity in the city of Ephesus. In this tendentious allegory, the devotees of John the Baptist are absorbed into the Pauline brotherhood. And the universal message? Repentance of sin is insufficient. Submission to the Lordship of Christ, the clarion call of Paulism, is the requisite. "Paul, having passed through the upper regions, came to Ephesus ... This continued for two years; so that all they which dwelt in Asia heard the word of the Lord Jesus, both Jews and Greeks." – Acts 19.1-10. The apostle's outward journey is vagueness itself, and fails to mention a single town in the whole of Galatia, Phrygia, Macedonia or Greece. The set piece is the riot of silversmiths in Ephesus. The return journey, in contrast reads like a mariner's log. The set piece is the tearful farewell to Paul from the elders of Ephesus (summoned into the apostolic presence at Miletus). A second absurdity in Ephesus relates the invention of the magic handkerchief, such a boon to Christian fraudsters for the better part of two millennia. It seems that bits of cloth that had been touched by Paul were taken to sick people and miraculous healings had occurred. Even Jesus hadn't performed such a trick! "And God was doing extraordinary miracles by the hands of Paul, so that handkerchiefs or aprons that had touched his skin were carried away to the sick, and their diseases left them and the evil spirits came out of them." – Acts 19.11-12. How delightful! Here was the power of Christ that could be replicated on an industrial scale! Given that the importance of the sacred NAME has already been established, we next encounter audacious "vagabond Jews", working Paul's turf and using the magic incantation "Jesus Christ"! How dare they? But the story is even more curious than that. The leading exorcist is a priest called Sceva. He and his seven sons are attempting to expel evil spirits (good guys, surely?) but one particular demon says he doesn't know who they are! "Jesus I know, and Paul I recognize, but who are you?" - Acts 19.15. The whole posse of Jewish exorcists are trounced by the demon-possessed man and are chased out of the house "naked and wounded". And the point of this absurd story? Precisely to establish a Church monopoly. Righteousness alone is insufficient for salvation, the holy name is required (story one); from the correct (Church) sources, salvic gifts are readily available (story two); but unauthorized use of the holy name won't get you anywhere. Without the Church you'll land up "naked and wounded"! In other words, buy this product only from accredited salesmen! And just to make sure that the monopoly is complete we are presented with a fourth fantasy, book burning! "Many of those who were now believers came, confessing and divulging their practices. And a number of those who had practiced magic arts brought their books together and burned them in the sight of all. And they counted the value of them and found it came to fifty thousand pieces of silver." – Acts 19.18-19. The main drama set in Ephesus – in fact, the pivot of the whole third mission – is the purported "riot of the silversmiths." Supposedly, a silversmith called Demetrius (note the fine detail here, in stark contrast to waving off the entire mission to Anatolia in a single sentence) convened a meeting of his fellow craftsmen and complained of Paul's soaraway success! The very words of Demetrius in this presumably private gathering are recorded. Gracious, it must be true then! "Not only in Ephesus but in almost all of Asia this Paul has persuaded and turned away a great many people, saying that gods made with hands are not gods." – Acts 19.26. The craftsmen were fearful that because of the preaching of Paul their livelihood was in peril. But in fact nobody thought the trinkets and icons were gods – only that the gods might choose to invest the symbols of their majesty with their divine presence – in fact, precisely the same pious hope that Christians attached to their own churches – and in the case of Ephesus divinely infused handkerchiefs! How likely was it that "the whole city" (that's somewhere between a quarter and half a million people) was "filled with confusion" by anything said by Paul? How likely that they "rushed with one accord" into the theatre (capacity 25,000), mindlessly chanted "Great is Diana of the Ephesians" for two hours and yet had no idea why they had assembled? – "The assembly was confused: and the more part knew not wherefore they were come together." In a most unlikely twist, disciples restrained the would-be boldness of Paul, "suffering him not" to enter the theatre – perhaps the only instance where the determined apostle was deflected from an intended course of action. We are told that "Even some of the Asiarchs (local officials), who were his friends" added their voices urging caution. Without uttering a word, Paul makes himself scarce – the plot requires him to move rapidly on to Macedonia. Meanwhile, in a familiar pattern, a figure in authority (one of those friendly local officials!) vindicates Paul as guiltless and dismisses the assembly! Some riot! The use of that word "Asiarch" is seized upon by some apologists as an "authentic detail" but nothing so commonplace can rescue the ludicrous story for "history." Ephesus was a major centre of the imperial cult. How likely, then, would it be for Paul to have had friends among the Asiarchs when one of the primary duties of these civic officials was the promotion of that very same imperial cult! The whole episode is a concatenation of the highly improbable and the plainly ridiculous. And it is a pity that the apostle did not really have the power of prophecy. He might have foreseen the vast trade in Jesus trinkets that would fill the centuries ahead! "After the uproar ... Paul departed for Macedonia. And when he had gone over those parts and given them much exhortation he came into Greece and there abode three months. And when the Jews plotted against him as he was about to sail to Syria, he decided to return through Macedonia ... But we sailed away from Philippi ... to Troas ... Minding himself to go afoot, he met with us at Assos, we took him in, and came to Mitylene ... The next day against Chios, the next we arrived at Samos, and tarried at Trogyllium, and the next day we came to Miletus ... After ... a straight course unto Cos, and the day following unto Rhodes, and from thence unto Patara ... And finding a ship sailing over unto Phenicia, we ... sailed into Syria, and landed at Tyre ... to Ptolemais ... unto Caesarea ... and went up to Jerusalem." – Acts 20.23 - 21.15. On his third adventure Paul's foray into Macedonia and Greece are dismissed in a sentence – the mission must have gone jolly well then! Instead, we get a detailed guide to the return voyage through the islands of the eastern Aegean (a clue, surely, to the true author of Acts). But it is a rather curious journey. 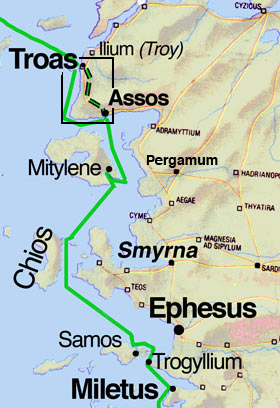 Bizarrely, Paul, in a hurry to get to Jerusalem, leaves his ship when it reaches Troas on the coast of western Asia Minor in order to walk the 30 miles across the desolate headland of the Troad and then rejoin his ship at Assos. Duh? Paul goes walkabout at Troas – Lord knows why! And we went before to ship, and sailed unto Assos, there intending to take in Paul: for so had he appointed, minding himself to go afoot. And when he met with us at Assos, we took him in, and came to Mitylene." The point of Paul's trek, of course, is entirely theatrical fiction. The author of Acts wants to draw Paul in high relief at Troas. Whilst all his companions rest for seven (or more) days in the city and then sail around the cape, the tireless apostle is with them but a single day and spends that preaching all through the night (wow!). The sermonizing is interrupted only by a quick resuscitation of a dead youth (WOW!). With the dawn, our hero sets out on foot for pastures new, no doubt to put in that extra mile of missionary work as he traipses along the Scamander river valley. The apostle is clearly a peerless saint, supercharged on Holy Spirit. And yet Paul's behaviour in the Troad stands in surprising contrast to his lack of interest in the major cities of the region: Pergamum, Smyrna, and the other "churches of Asia" celebrated in the Revelation of St John and the object of so much attention from Ignatius and Polycarp! All these cities the saint is happy to sail past and ignore totally! Sailing by AND summoning the Elders? "For Paul had determined to sail by Ephesus, because he would not spend the time in Asia: for he hasted, if it were possible for him, to be at Jerusalem the day of Pentecost." – Acts 20.16. Ostensibly, Paul was in a hurry to reach Jerusalem for Pentecost (yet he had just chosen to walk from Troas to Assos, rather than take ship with the rest of the guys?!) For this reason Paul sailed right past the port of Ephesus. Instead, he made landing further down the coast at Miletus where he summons "elders of the church" to come to him from Ephesus (Acts 20.17). His purpose was to bid farewell. However, the entire episode is a pious fantasy, as a close examination of the ancient topography makes startlingly obvious. 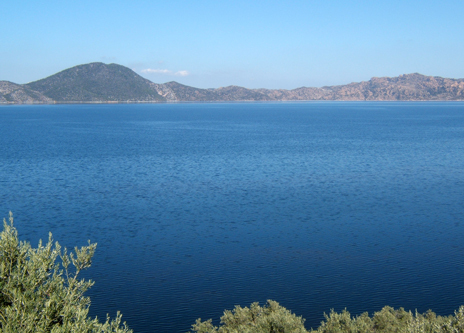 Any journey to or from Ephesus would have been complicated by the fact that Miletus stood on a peninsula and remained so until further silting of the delta finally closed the Gulf of Latmos during the Byzantine era and created Lake Bafa. Paul would have needed to send a messenger to Ephesus to announce his arrival and then have waited for the presbyters to arrive. 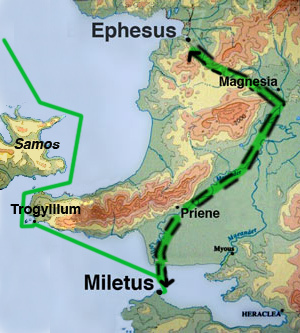 It was a journey of over fifty miles in each direction and both the messenger and the brethren would have needed a small vessel themselves to sail between Miletus and Priene! Scarcely a way of expediting the apostle's return to Jerusalem! The whole pericope is a fantasy and merely a vehicle for a 450-word self-justifying sermon, the only one delivered exclusively to believers, with Paul boasting of his humility (! ), his readiness to die, his tireless, tear-sodden evangelism, and issuing a warning of "savage wolves" arising even from their own number (Acts 20.19-32). Curiously, the author of Acts even has Paul quote the words supposedly of Jesus, "It is more blessed to give than to receive" – the words of a man he never met! The little melodrama ends with hugs and kisses, the brethren distressed that they will never see Paul again. And of course they won't – the author of Acts knows how he will end his pious fantasy! "The Holy Spirit testifies to me in every city that imprisonment and persecutions are waiting for me." In antiquity, the Gulf of Latmos was an arm of the sea. Roman Asia teemed with large and densely populated cities – and a vibrant pagan culture. Ephesus, the provincial capital, at the outlet of the Cayster river, had a population second only to that of Rome. 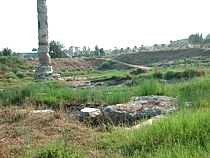 Beyond an obvious commercial importance, and the fabulous sanctuary of Artemis (Diana to the Romans), the city, like many others on the Pauline adventure trail, was a major centre of the imperial cult – and Domitian's temple here was one of the largest. 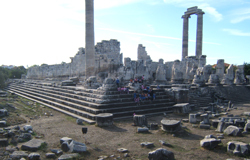 Miletus was similarly an important port city with a major religious role. 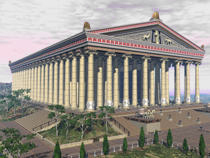 It had its own Temple of Artemis which was linked to a "twin" Temple to Apollo at Didyma by a twelve mile sacred causeway. Pilgrims arrived by sea and followed the processional route. The shrine of Apollo at Didyma was already more than a thousand years old when described by Pausanias in the 2nd century AD. "In the time of Paul" it drew thousands of pilgrims to its oracle and annual spring festival, the Didymeia. One of the three largest largest temples of the Roman world, the Temple of Apollo at Didyma was still under construction when Emperor Trajan paid his respects. Along the upper reaches of the Meander-Lycus valley stood Hierapolis (its very name "sacred city"), famed for the healing quality its thermal springs. Gods honoured for this blessing included the mother goddess Leto-Cybele, Apollo and Pluto. A vent beneath the Temple of Apollo, believed to be an entrance to the underworld, released noxious vapours and gave the priestesses their heady powers of prophecy. In the 5th century the Christians attempted to wean the thousands of annual visitors away from the old gods by introducing a shrine to the martyred "St Philip", though with complete ambiguity as to whether this was the evangelist or the disciple! Supposedly, Philip had performed his own "miraculous healing" on the wife of the pagan city governor, converting her to Christianity. Her enraged husband had the miracle worker crucified and beheaded. 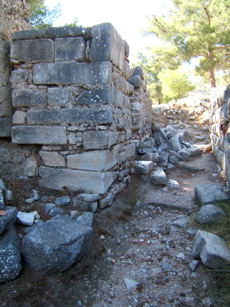 During this same period of enforced conversion, the distraction of immoral bathing came to an end when the bathhouses of Hierapolis were converted into churches. On the opposite bank of the river stood Laodicea, a famously wealthy centre of the wool, cloth and dye industries. 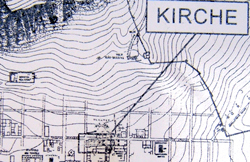 Besides the textile trades, the city had a notable school of medicine. The principal local deity was Men Karou but Laodicea also was a regional centre of the imperial cult. 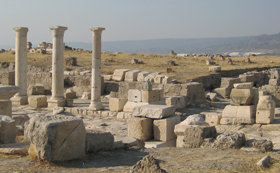 The prosperity of Laodicea overshadowed the nearby town of Colossae, which, though a major centre during the Persian era, entered serious decline from the 1st century BC. It suffered a devastating earthquake during the time of Nero, and disappeared entirely by the end of the 4th century. Tellingly, it is this insignificant place, rather than any of the major cities, which receives its very own "epistle from St Paul" – Colossians. 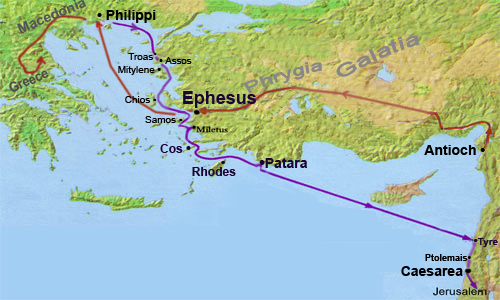 The apostle Paul supposedly spent about three years at Ephesus yet, believe it or not, he never visited Colossae (or Laodicea or Hierapolis for that matter), centres of early Christian activity and easily reached on foot from the coast in three or four days. Papias, a bishop of Hierapolis around the year 130 and purportedly the first Christian to collect "sayings and deeds of the Lord", knows nothing of Paul or his epistles, even though he lived a few miles from Colossae. So was Paul ever really in Ephesus? In any event, the notion that a "bold" evangelist, even one animated by dreams and visions, could, in a few years, with hankies and oratory, overturn a rich, vibrant and ancient pagan religious culture, is nothing other than laughable. Exuberant Roman urbanisation of the Meander-Lycus river valley. 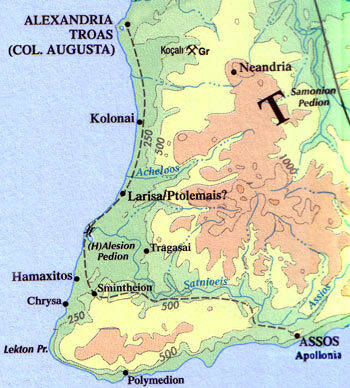 Rome established the province of Asia in 129 BC by combining Ionia and the former Kingdom of Pergamum. It was one of the richest and most densely populated regions of the entire empire. 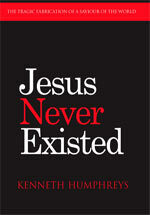 "The apostolic age is a creation of the Christian imagination. By the end of the 3rd century, gloria abounded. Christians could look back on brave martyrs, courageous bishops, brilliant teachers, sophisticated literary works of charm and elegance, controversies and conflicts, legends and romances and adventure stories. – R. Wilken, The Myth of Christian Beginnings, passim. With Jews settled in the 3rd century BC by the Seleucid Greeks in their western capital of Sardis, it was, perhaps inevitable that, in the passage of time, Jewish sectarians of all stripes would find their way into the province of Roman Asia. To explain the appearance, in the 2nd century AD, of small groups of Jewish "Christ worshippers" or Gentile "god fearers" of similar proclivities, within an overwhelmingly exuberant polytheistic culture, requires no superlative apostle or barnstorming evangelisation. No Paul is required for his "organizational brilliance" or spellbinding rhetoric. As a literary construct "Paul" merely introduces religious correctness and doctrinal purity to small but already functioning factions within Hellenised Judaism. But here was no mass conversion of an entire non-Jewish population – several million people by any reasonable estimate. Myriad enthusiasms fed into a nebulous and widespread 1st century "solar deity movement", a movement that lacked cohesion and direction until the Roman state itself adopted the ideology and regularised its dogmas. The Imperial cult gave visible form to a personified saviour of the world, its sanctuaries taking up a magisterial presence in the heart of the new metropolitan centres – such as Caesarea, Corinth, Philippi, Antioch, Ephesus – and every other city "visited by Paul"!